Thanks to several decades of research on the audiences for contemporary popular media, we now know much about various forms of fan engagement and participation. Yet, I am always hungry for more historical work that explores these same questions, if for no other reason, so we have a context for understanding what is distinctive about the current moment and what have been recurring issues around media audiences across a broader time span. 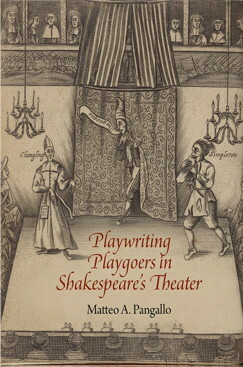 I was, thus, very excited to learn of a new book, Playwriting Playgoers in Shakespeare's Theater, which provides deep insights into the forms of participation desired and achieved by theatergoers in Elizabethian England. Its author, Matteo A. Pangallo, has uncovered a range of original scripts written by amateur playwrights with fantasies (in many cases) that they might join the repertoire of the various theater troops of the era. Through careful readings of this archival material, Pangallo gains deep insight into the forms audience engagement and participation took during this formative moment in Western popular theater. Given a chance to interview Pangallo, who contacted me because he was interested in the parallels and differences with contemporary fan culture, we were able to explore the historical roots (or lack thereof) of contemporary phenomenon, such as fan fiction, spoiling, catch phrases, and fan service. I appreciate his willingness to engage with my questions, since this interview offers a productive bridge between historians and cultural studies researchers writing about audiences. We both try hard not to get too anachronistic in describing these practices as an early form of fandom, a word and concept not in use during this period, but we can certainly see playgoers as forming intense relations with plays, characters, and performers, which encouraged them to return for multiple viewings, to share their insights with each other and the producers, and to create their own works in the same genres of the plays they admired. This is the first of a number of interviews I plan to run through the fall, exploring the current state of fandom and fan studies. Keep reading. You write about “an audience-stage relationship that was intensely dialogic, participatory and creative.” In what ways? What forms did audience participation take and what did the professional theater troops do to recognize this grassroots creativity? Most fundamentally, as a commercial enterprise—indeed, England’s first regular, cultural commercial enterprise—Shakespeare’s theater empowered its audience with the ability to shape through consumer demand the kinds of content produced by the playmakers. If a particular genre, style of writing, or type of narrative were to fall from favor, attendance at those plays would fall off and the playmakers would have to shift the repertory away from that kind of material or risk losing paying customers to a rival playhouse or troupe. This power of the purse created a dynamic in which playgoers came to understand themselves as collaborative participants in shaping the plays that they were watching and the repertory of the companies. And many of the playmakers acknowledged as much; often epilogues delivered at the end of a play would invite playgoers to identify what parts of a play they did not like, implying that the play could be revised and revived to align more fully with their desires (whether or not playmakers actually followed through on such promises is unclear). Playmakers frequently drew attention (some positively and some negatively) to the fact that each audience member individually had the capacity to imagine and interpret the fiction that they were watching. But even beyond that kind of internalized participation, we have ample evidence of playgoers participating in an externalized fashion, making comments, both favorable and unfavorable, on plays in the midst of performance. These responses included shouting out their own ideas for lines, bantering with the clown, mocking bad actors, throwing objects, hissing villains, cheering heroes, calling for popular bits to be done again and again, asking for particular jigs or songs, and so forth. In some instances, playgoers’ externalized responses during performance evidently prompted the actors to change or even abandon their original intentions (that is, the playwright’s script), though in other instances they likely ignored the outburst. Even when the outburst was ignored, however, in the context of a live performance, an unscripted response from any one playgoer necessarily informed for the rest of the audience their experiences and understanding of the play, with potentially radical results. There are a few accounts of a single spectator laughing at a tragedy or weeping at a comedy and, by virtue of their generically inappropriate conduct, changing how other playgoers thought about the play, subverting the playwright’s and actors’ generic intentions for the play and, in effect, undermining the supposed “authority” of the mainstream cultural producers. We shouldn’t forget that Shakespeare’s playhouse, with its shared light and three-quarters seating (sometimes with patrons even sitting on the stage or on the balcony behind the stage), was a venue in which audience members were as much on display as the play they had come to watch. It was an environment that encouraged consumers to connect with the producers and even intervene in the act of production, rather than, as in the modern proscenium-arch theater, obediently disappear from view and observe silently. You have stumbled onto such a rich mine of materials here that offer us perspectives on what audiences of Shakespeare’s time thought about the theater. Why are people just now writing about such practices? Shakespeare’s audience has long been the subject of interest for scholars, though earlier audience studies—such as Alfred Harbage’s 1941 Shakespeare’s Audience, Ann Jennalie Cook’s 1981 The Privileged Playgoers of Shakespeare’s London, and Andrew Gurr’s 1989 Playgoing in Shakespeare’s London—focused less on audience experience and more on resolving the fundamental questions of who comprised those audiences, their demographics, playgoing habits, and preferred venues. A separate branch of audience studies took an interest in audience desire and experience, but addressed themselves to recovering evidence of that desire and experience through the critical study of plays written by professional playwrights. These studies—such as Arthur Colby Sprague’s 1935 Shakespeare and the Audience, Ernst Hongimann’s 1976 Shakespeare: Seven Tragedies, The Dramatist’s Manipulation of Response, Jean Howard’s 1984 Shakespeare’s Art of Orchestration, Ralph Berry’s 1985 Shakespeare and the Awareness of the Audience, and Jeremy Lopez’s 2003 Theatrical Convention and Audience Response in Early Modern Drama—center upon the reasonable premise that successful commercial playwrights (such as Shakespeare) were successful because they understood what their audiences wanted; furthermore, truly effective playwrights (like, again, Shakespeare) could even control, or orchestrate, audience experience and desire. This approach, of course, does not actually study the audience itself; rather, it studies the playwright’s understanding of, and assumptions about, his audience—that is, it’s really a study about the playwright, which is naturally going to be of interest when the playwright you are talking about is Shakespeare. And, in the end, neither approach was really able to address the question of audience understanding of the theater and how it worked. While all of this was happening in the world of early modern studies, a different approach to the theatrical audience was taking shape in the parallel world of modern performance studies, in works such as Keir Elam’s 1980 The Semiotics of Theatre and Drama, Patrice Pavis’s 1982 Languages of the Stage: Essays in the Semiology of Theatre, Daphna Ben Chaim’s 1984 Distance in the Theatre: The Aesthetics of Audience Response, Susan Bennett’s 1990 Theatre Audiences: A Theory of Production and Reception, J. L. Styan’s 1995 Drama, Stage, and Audience, and the 2003 essay collection Audience Participation: Essays on Inclusion in Performance, edited by Susan Kattwinkel. These scholars emphasized the idea of the playgoer as a collaborative playmaker, participating in the production of dramatic meaning and even the “play” itself (taking the “play” to be, not the script, but the performance of the script). Within the past two decades, early modern audience studies has begun to catch up with this approach and a third way of thinking about the Shakespearean audience has emerged that is neither the old demographic approach nor the “orchestration” model. This new approach operates from the premise that early modern playgoers were participatory and engaged in the creation of dramatic meaning, both within their individual imaginative capacities and within the material ecosystem of playhouse culture. In this model, playgoers cannot be properly understood merely as just one part of a larger demographic group or as passive consumers simplistically “orchestrated” in their responses or desires. One of the earliest works to employ what I refer to as the “new audience studies” was Cynthia Marshall’s 2002 The Shattering of the Self: Violence, Subjectivity, and Early Modern Texts, but I think that the first to truly make the approach its central methodological framework was Charles Whitney’s 2006 Early Responses to Renaissance Drama. Since then the approach has been adopted by many of the essays in the 2011 collection Imagining the Audience in Early Modern Drama, edited by Jennifer Low and Nova Myhill, as well as in studies such as Allison Hobgood’s 2014 Passionate Playgoing in Early Modern England and Richard Preiss’s 2014 Clowning and Authorship in Early Modern Theatre, as well as in studies dedicated to subjects beyond the audience itself, such as David McInnis’s 2013 Mind-Travelling and Voyage Drama in Early Modern England. The novelty of the contribution made to new audience studies by Playwriting Playgoers in Shakespeare’s Theater lies in its emphasis upon the original creative work of playmaking playgoers; rather than looking only to how audience members responded to professionals’ plays, my interest is in their own authorial urges and how their agency (or, at times, perception of agency) within the playhouse ecosystem led them to both replicate and deviate from what they assumed to be the systems and conventions of professional playmaking. Scholars have long known about the plays that I discuss, though they have yet to think about them as a group sharing a common point of origin (in the audience) and they have been hesitant to make much use of them, either for literary criticism (few are what a judicious reader might consider quality writing) or theatrical history, since, as works by amateurs, they are usually assumed to be “naïve” or simply “ignorant” about the mainstream industry and its operations. While I wouldn’t presume to make an argument about the literary value of most of these plays, I do want to recover their value for theater history. Their position outside of the mainstream industry is, in fact, precisely why they have value. Like a work of modern fan fiction, each of the playgoers’ plays provides evidence of a particular, dedicated consumer’s perspective on the cultural industry that he patronized. What has been the relationship so far between what you are calling the “new audience studies” in literature and the way cultural studies scholars have approached the audiences and fans of contemporary popular media? What might the two fields learn from each other? I think there has long been a tendency in early modern audience studies to valorize the authority of the playwright—that is, the cultural producer—because that playwright was, for most scholars, Shakespeare. That valorization, though, usually came at the expense of the audience, which is so often imagined to have been dutifully compliant to the dramatic experience shaped for it by such a “genius”. Cultural studies of modern audiences of popular media have much to teach historians of the early modern audience, as well as critics of early modern drama, because Shakespeare’s theater was definitively also one of “popular media”. How we typically consume Shakespeare in a theatrical context today—in a rarefied venue, with darkened house lights, surrounded by an obediently silent audience—is not how Shakespeare was consumed in his own day, nor was it the kind of audience for which Shakespeare wrote. There has been, in my view, too little engagement between early modern audience studies and studies of audiences of contemporary popular media. In part, this disconnect is a product of the scholarly fear of anachronism; at the same time, however, the early modern audience was the first modern audience, just as Shakespeare’s mass-market profit-based theater was the first modern form of commercial cultural production. Scholars of the early modern audience could thus better contextualize the slender amount of evidence we have about actual playgoer experience by turning to the work done by modern popular culture audience studies. In particular, it would be helpful for early modern audience scholars to recognize the degree to which modern audience studies have established the extent to which the consumer of popular culture should be taken seriously as someone who could be highly engaged with, informed about, and participatory with mainstream, commercial cultural production. Again, there is this notion—mistaken, in my view—that Shakespeare’s audience was reverentially and transfixedly passive in its consumption of theatrical entertainment. If we know anything about modern audiences of popular culture, it’s that they rarely sit still silently and just watch. The same was true, I maintain, for the dedicated members of Shakespeare’s original audiences. What counts as amateur in an age when the status of professional playwrights has not yet been fully secured? As you ask at one point, in what ways do amateurs and novice professionals differ? No definite line between professional and amateur existed in the period; at the time, the term “profession” referred to spiritual conviction and the term “amateur” did not exist at all (the word “avocation” did, but it, too, had religious connotations). Nonetheless, by the 1590s, a functional theater “industry” certainly came to exist: it had dedicated venues, regular materials, relationships with patrons and the government censor, staging conventions and manuscript conventions, standard business practices and models, repeat customers, investors, profits and losses, and both formal and informal methods for entering and working within it. This final category is perhaps the most important. A profession is formally defined as a field of labor in which those who are currently practitioners exercise control over who may enter it and how they may work within it—what is often referred to as “occupational closure”. In Shakespeare’s theater, occupational closure over playwriting took three routes: some dramatists learned how to write plays while they were students at university (these writers were most active in the 1580s and 1590s), some learned to write plays by being actors themselves (including Shakespeare), and some learned to write by being apprenticed to an established professional and working collaboratively with him for a time (Shakespeare’s rivals, the Lord Admiral’s Men, did this often, but shortly before he retired Shakespeare did it too, collaborating with his successor, the young John Fletcher). And you performed a servant’s faithful parts. Which I, your master, first did teach the age. There were some playwrights, however, who did not follow these systems. As Jonson goes on to complain in his poem, “Both learned and unlearned, all write plays.” Best known are the aristocratic dilettantes of the 1630s and early 1640s who wrote a play or two for the professional actors to stage before the royal family or for elite audiences at one of the indoor theaters. These amateurs had no interest in entering the socially disrespectful profession of the theater; they wrote merely to secure attention, and some sense of influence or importance, at court. My book looks at a group of playwrights who were neither aristocrats nor participants in any of the informal mechanisms for professionalization. Indeed, many of the playwriting playgoers explicitly stated that their intention was not to enter the profession. I define these amateurs, then, by both their socioeconomic status (because they were not courtiers, they did not have the same political motivations for writing as the aristocratic amateurs) and by their distance from the established producers’ understanding of playmaking. Importantly, however, and one of the findings that I emphasize, that lack of distance did not correlate to ignorance; rather, when we look at evidence in the plays, such as the categories that I cover in the book (stage directions, revising practices, and stage poetry), these amateurs repeatedly demonstrate diligent attention to (if sometimes incomplete understanding of) the way plays were made into performances. Dr. Matteo Pangallo is an assistant professor of English at Virginia Commonwealth University. Previously he was a Junior Fellow in the Society of Fellows at Harvard University, and, before that, held teaching positions at Bates College, Mount Holyoke College, and Westfield State University. He received his M.A. in Shakespearean Studies from King’s College London and the Globe, and Ph.D. in English from the University of Massachusetts Amherst.